This is another fun, stranded knit, but a bit more complicated than Houndstooth Obsession. By using three colors for the candies, you have to cut your yarns after each use. This creates a ton of ends. Some of my testers decided to use a single variegated yarn for the candies, thus eliminating the weaving in problem! It's still a pretty easy chart to follow and after knitting these up, you will have a sweet pair of socks! The pattern is written for three sizes and uses around 25-30 grams of 3 colors and around 60-70 grams of the main, background color. 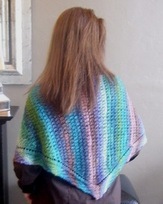 Or you can buy the pattern directly from Knit Picks, here, as it is part of the Independent Designers Program.